It’s been almost 4 years since I started Abduzeedo and my life has changed in ways I could never imagine. In particular when it comes to meeting new people and learning new things. Because of the blog and its visibility around the world, I have been invited to talk at many universities and conferences worldwide. I'll be the first to admit that I am far from being a good public speaker, but to get an opportunity like that is really cool. I'm always learning from these experiences, and that in itself is awesome enough. When I ask people what they want me to talk about at these events they always say, "Talk about how you made the blog popular", or "Talk about how you make money from the blog". That leads me to think that all everybody wants is fame and money. Well… what else might you want? Gladwell's conclusion, after studying how people make instant decisions in a wide range of fields from psychology to police work, is that we can make better instant judgments by training our mind and senses to focus on the most relevant facts—and that less input (as long as it's the right input) is better than more. Perhaps the most stunning example he gives of this counterintuitive truth is the most expensive war game ever conducted by the Pentagon, in which a wily marine officer, playing "a rogue military commander" in the Persian Gulf and unencumbered by hierarchy, bureaucracy and too much technology, humiliated American forces whose chiefs were bogged down in matrixes, systems for decision making and information overload. But if one sets aside Gladwell's dazzle, some questions and apparent inconsistencies emerge. If doctors are given an algorithm, or formula, in which only four facts are needed to determine if a patient is having a heart attack, is that really educating the doctor's decision-making ability—or is it taking the decision out of the doctor's hands altogether and handing it over to the algorithm? Still, each case study is satisfying, and Gladwell imparts his own evident pleasure in delving into a wide range of fields and seeking an underlying truth. Why do I bring this up? I have some examples in my life that might enlighten you further. In 2006 I was just a graphic and web designer doing my best to deliver good quality work. I noticed that the blogosphere was getting bigger and that this social media thing was the future. But I always had some excuse to not get into it…usually external factors such as, I don’t have time for such a thing, or nobody will pay attention to what I say, or there are guys much better than I. My brother had a blog back in those days and he kept asking me why I didn’t and that I should start one. I was very stubborn until something happened. Towards the end of November 2006 my office was robbed and with that I lost my laptop and backup disks. 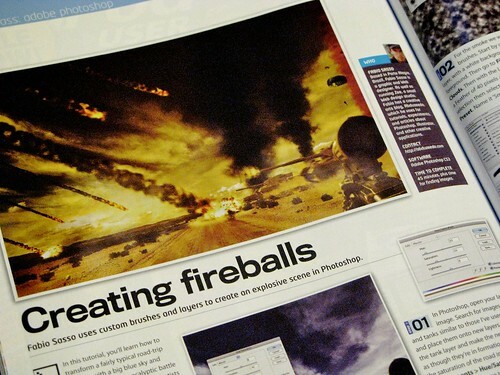 That was a key factor that led me to start Abduzeedo. This whole thing made me forget those excuses and simply do something…which is exactly what I did. I learned that sometimes we have to think less and do more, because when we have too much information it’s pretty hard to make a decision. And also, this information might suffer the influence of other people’s opinions as well. Because of the blog some great opportunities started appearing. One in particular helped me to evolve a lot: writing for PSDTUTS. When Collis invited me I accepted on the spot and was pretty happy about it, but when I talked to some friends they always asked, "You're going to write tutorials for a competitor?" Well, I didn’t even think about it that way. I just wanted a motivator to push me to explore and learn more about Photoshop. Plus, they were also paying me for those tutorials, so that was amazing. I learned Photoshop so much in those days and it was so much fun. I loved writing those tutorials especially trying to simplify effects and share with the community. Writing for PSDTUTS turned out to be one of the best things I’ve ever done for Abduzeedo. After the few months I wrote for them the traffic on Abduzeedo grew considerably and besides that, more people got to know me. As a result, I was invited to write for magazines and other publications as well. Well this is something that doesn’t make much sense at first, so let me explain. In 2008 I decided that I would go to the US for the summer. I told my business partner, Fabiano Meneghetti and he understood and totally supported me. However some people thought I was crazy simply leaving my company here and going out there. Even though I thought it was the right thing to do, those bad comments got me thinking and sometimes made me a bit unsure and insecure about my decision. Nevertheless, I went. After those 3 months in the US I got the chance to meet so many people, and even got a job which ended up paying for all my traveling expenses. But the most important thing was that I learned so much from that experience. I also was able to improve a little bit of my english with the help of my amazing cousin Amanda Macedo AKA @amlight. The same happened in my other trips, and in the last one it was no different. I had just gotten back to Brazil when some guys invited me to join them in this new venture: an american startup with a mobile platform project. So, we went to San Francisco. While planning the trip I was kind of scared after looking at rent prices. Nevertheless, I went…again. And thank God I did. Going to San Francisco was incredible and once again the experience I had was gold. If I had stayed here and done the right thing in terms of logic, I never would have visited Adobe and talked about my work to the Photoshop engineers or shaken hands with Russ Brown. I never would have met Trey Ratcliff and seen him speak at Google, or hang out with Vitor Lourenço one of the mighty designers behind Twitter. As you can see a lot happens when you make a decision. Of course there’s always a downside. Nothing after-all is perfect. Life would be boring otherwise. Also, everything takes time. It’s sort of like planting…you'll never get results right away, because you need to get experience, learn and be prepared. We have to persist if we believe in what we’re doing. At least it was like that with Abduzeedo. It took over one year for the results to start appearing. I believe the most important thing in life is to do what you like and make decisions based on your own opinion and not based on what other people think. I know that's pretty much what Steve Jobs said in his commencement speech at Stanford and it makes so much sense. Or perhaps it makes more sense now after these almost 4 years of blogging, because that is the most important thing I have learned. In other words, put yourself out there, have passion, confidence, and persistence.